Dimensions 1 by 7.75 by 9.75 in. Amazon.com description: Product Description: Naked Its not himits the food! Jamie Oliver, a.k.a. 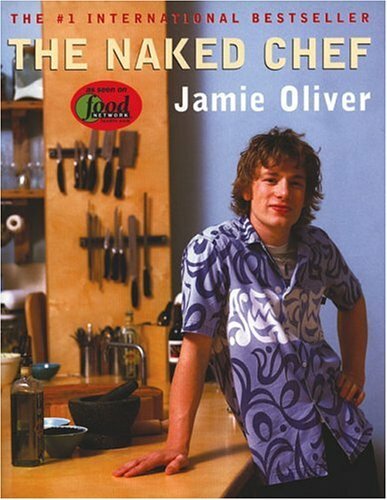 the Naked Chefis Englands #1 bestselling food sensation, a charismatic, streetwise culinary wonder boy whose personality is as fresh and unpretentious as his cooking. In this extraordinary cookbook, Jamie takes all of the trade secrets he has accumulated since he started cooking at age eight and distills them into a refreshingly simple style that really works for people who are passionate about food, but dont always have a lot of time, money, or space. Jamie has applied his strip it bare then make it work principle to all his mealsfrom salads to roasts, desserts to pastasand has created a foolproof repertoire of simple, feisty, and delicious recipes that combine bold flavours with fresh ingredients. With more than 120 fuss-free recipes, The Naked Chef, a sumptuous feast for the eyes as well as the stomach, is modern cooking at its best. About: Offers a simple approach to food preparation and features more than 120 recipes that combine bold flavor and fresh ingredients. About: Hardcover: 256 pages Publisher: Michael Joseph (1999) Language: English ISBN-10: 0718143604 ISBN-13: 978-0718143602 Product Dimensions: 9. About: A charismatic young English chef offers a refreshingly simple approach to food preparation in a cookbook featuring more than 120 delicious recipes that combine bold flavor with fresh ingredients and a 'stripped to the essentials' style.